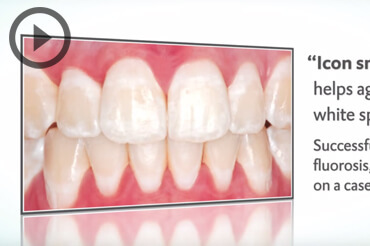 Do you suffer from white spots or mottling on your teeth! At the Harley Street Dental Clinic we're using a revolutionary treatment called Icon, which can improve the appearance of white's spots or a mottled appearance of teeth without an injection or drilling. Fluorosis – this occurs when there is a very high fluoride intake when the adult teeth are developing. Wearing braces causing decalcification – this is the loss of minerals from the enamel and can occur during fixed braced treatment if there has been a lapse in excellent oral hygiene around the brackets as it is difficult to brush your teeth. In the past, the primary approach to the treatment of white spots is remineralization using pastes, creams, and topical treatments. Some of these include fluoride therapy or some form of calcium phosphate paste. 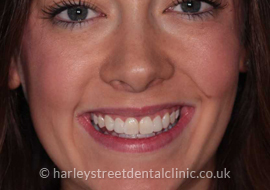 Teeth whitening may also be used as an option to alleviate the appearance of these white lesions, but this would have little effect, as the white spots will still remain a lighter colour than the rest of the tooth.Other more invasive approaches to dealing with white spot lesions include, composite bonding restorations, and veneers or crowns, however these types of treatment require the removal or destruction of healthy tooth material and are not favoured in dentistry now. 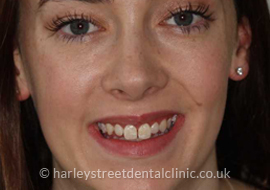 At the Harley Street Dental Clinic we offer a treatment called Icon, which can restore the natural colour of your tooth with no need to drilling or have an injection. This minimally invasive technique uses a process of infiltration to blend the white spots in with the rest of the tooth.